1001 Faces of Orientalism exhibits for just one more month (ending on August 11) at the Sakıp Sabancı Museum and this compelling foray into 19th-century Europe’s fascination with the Orient should not be missed. The term ‘Orient’ was first used only to describe the Middle East, but – due to the increasing political, economic and colonial relations, as well as opportunities to travel between Europe the ‘Orient’ regions – Europeans employed the term to signify the region that incorporates India, China and Japan. Orientalism gained prominence in the late 18th century when Napoleon waltzed into Egypt (then Alexandria) and Syria, under the pretence of protecting French trade, in order to undermine Britain’s access to India and also, interestingly, to establish a scientific and cultural enterprise in the region. Armed with an army of scholars and scientists – alongside the military one – the goal was to attain ‘cultural mastery and academic knowledge’. These experts went on to form the nucleus of the Egyptian Institute that Napoleon founded in 1798. In the contemporary academic world, ‘Orientalism’ was the hot topic on everyone’s lips after the publication of Edward W Saïd’s 1978 foundational text of the same name. For Saïd the term ‘Orientalism’ described the ‘subtle and persistent Eurocentric prejudice against Arabo–Islamic peoples and their culture’ – cultural prejudices that derive from a long tradition of romanticised images of Asia and the Middle East. The goal of the 1001 Faces of Orientalism exhibition, according to the Sakıp Sabancı Museum: ‘is not to see Orientalism as a unilateral discourse under the control of and centred on the West that divides cultures into two polarised groups, but also to look at this phenomenon from outside the European context and distinguish its multiple, diverse, and sometimes contradictory aspects’. The exhibition spans a number of halls and rooms, each centred around a specific theme. The works on display include rare books, paintings, photographs, objects, examples of Ottoman architecture, interior and stage decorations, costumes, studio photographs and souvenirs. The show opens with Napoléon’s Egyptian Campaign (where the above painting, depicting a typical scene from the period, greets you), which leads nicely into an examination of Oriental Studies. The sections which follow take the viewer on a breathtaking ride (no ‘magic-carpet ride’ puns here – Saïd would not be pleased) through subjects as disparate as archaeology, Islamic art, architecture, travel, fashion, cinema, photography and painting. The section on Eastern studies and books contains several examples of Oriental literature, which contributed to the stereotypes of the ‘Orient’. 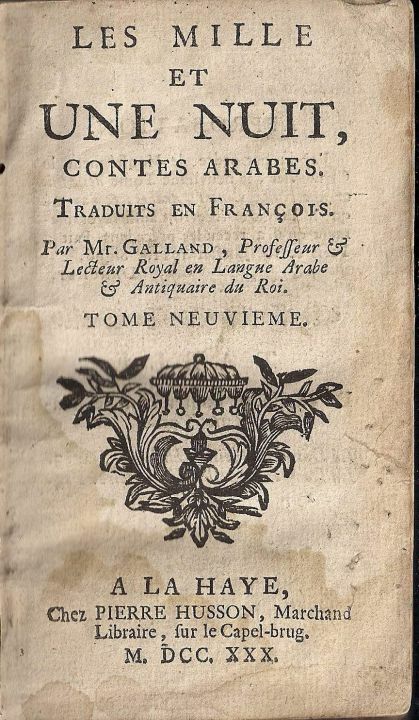 The exhibition’s title itself is a play on words from perhaps the best-known Oriental book amongst Europeans, the Thousand and One Nights, illustrated copies of which, translated by Antoine Galland from Arabic into French (above), are displayed in this section. This collection of West and South Asian stories and folk tales was written in Arabic during the Islamic Golden Age, which lasted from the 8th until the 13th century. 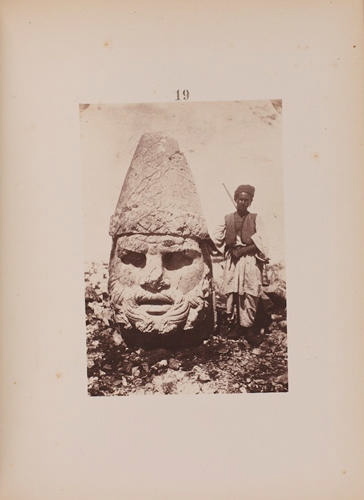 The archaeology section explores the ideology behind the rush to explore the historical sites of Ottoman Turkey throughout the 19th century. One of the most noteworthy aspects of this ideology was the belief that the locals in these regions had no connection with the remains of ancient civilisations; that their true heirs were of European extraction. Eastern antiques are intermittently juxtaposed with photographs portraying the local excavation workers as being ‘Oriental samples’ – as though they are part of a stage-set design. Orientalist paintings by Osman Hamdi are also included in this section, due to the artificial nature of their compositions, which greatly interested the West. Relevant archaeological fields are laid out with artefacts from such areas as Troy, Ephesus and Nineveh, on loan from the Istanbul Archaeology Museums. In the architecture section, examples of European and Ottoman architecture with an Orientalist style are presented. Orientalist architecture was the product of the West’s perception of the East – a perception that owed little to reality. The West saw the Orient as a faraway land of make-believe whose people were curious and exciting. After the Turkish threat had diminished following the Second Siege of Vienna in 1683, Western interest in Oriental architecture increased. The West was able to conjure up images of its style through pictures and descriptions in books documenting the architecture of Andalusia, Egypt, the Ottoman Empire, Persia and India. As with many aspects of Orientalist culture, the inspiration derived from its architecture was just that – inspiration – and often gave rise to playful interpretations. 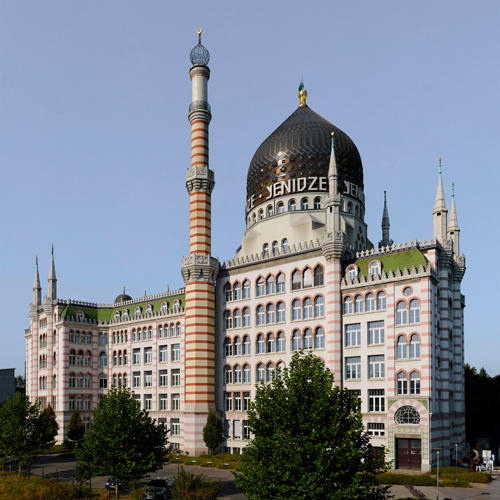 Aspects of it were used to add flair to holiday resorts, to amuse kings and their guests in certain rooms in palaces, even to add interesting touches to factories, such as the above Yenidze Cigarette Factory built in 1907 in Dresden, Germany. Turkish architectural motifs are specifically examined in this section, demonstrating the fascination with this aesthetic in cafés, grand houses, baths and pavilions all over Europe. Funnily enough, few of these reflected the true style of Ottoman Turkish architecture which showed how during this time in Europe, Ottoman architecture was only ‘Turkish’ in name. 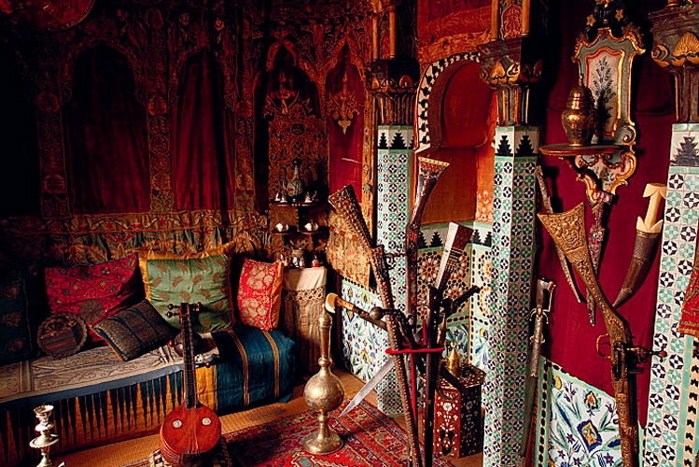 The ‘Orientalism and Decoration’ section explores the influence of Orientalism on interior design. There are scenes from Pierre Loti’s house in Rochefort, France (above), and Marius Bauer’s villa, Stamboel (Istanbul), in Aerdenhout, Holland. His illustrations for the aforementioned Thousand and One Nights are also displayed here. The exchange of objects between the East and the West – primarily fabrics and carpets, but also glass, metalwork, ceramics and other arts and crafts – can be traced back to the 11th century. During the 19th century there was a trend for artists and travellers returning from their adventures in the East to decorate their houses with things they had found there. Gorgeous objects are on display here, from fans bearing Eastern motifs popular in the early 20th century to lovely ceramic plates showing idealised scenes of Turkish cities, and hatboxes decorated with suggestive Eastern motifs. The East has always been known for its luxury goods, such as silk, precious stones and jewellery. 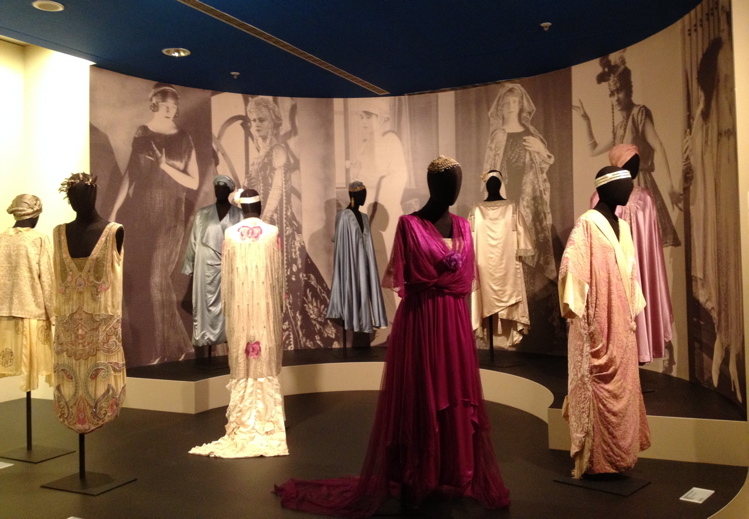 The fashion section of the exhibition casts a close eye on the phenomenon and influence of Orientalist dress. 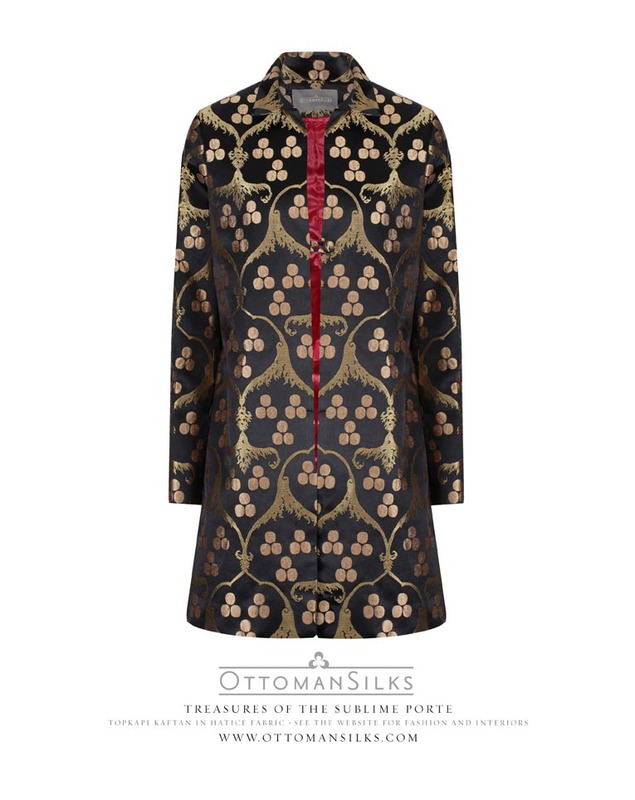 During the 17th century Turkish dress became popular, especially at the Palace of Versailles, where courtiers favoured jackets resembling caftans and broad silk sashes. Marie Antoinette and Catherine the Great were both fans of the Turquerie movement. 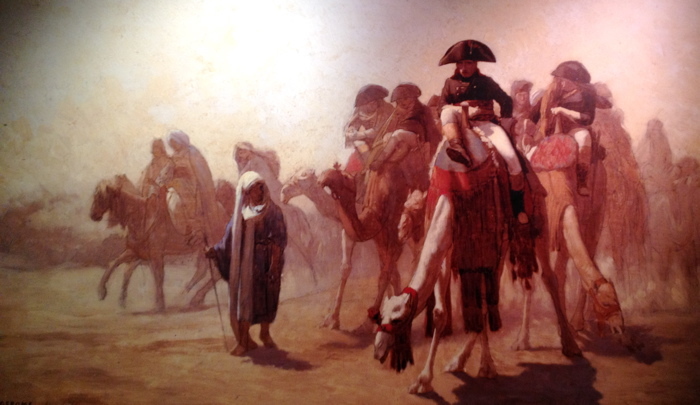 We are reminded again of Napoleon’s Egyptian campaign which saw Orientalist fashion taken to a new level. European high society competed over who had the finest fabrics, the best Orientalist motifs. Orient-themed balls – where guests dressed as Ottoman sultans, Iranian envoys and Indian rajahs – were the hottest invitations in town. The clothes on display here are intricately designed and highly luxurious, and it is easy to see why fashion houses around the words appropriated Orientalist motifs and made them their own. The last section of the exhibition, ‘Orientalism in the Studio’, shows paintings and photographs by Western artists depicting Orientalist themes and scenes. Over 30 paintings by such artists as Fausto Zonaro, Charles Amédée Philippe van Loo, Amadeo Preziosi, Fabius Brest, Marius Bauer, Walter Charles Horsley and Henriette Browne depict Eastern battles and hunting scenes, harems, hamams, daily life, ethnic costumes, portraits, desserts and oases, Bedouin life and prayers as recurring themes. The paintings in this section clearly demonstrate the West’s portrayal of the Orient, and their delicate brushwork, bright colours and ethereal lighting contribute to the feelings of romanticism and fantasy which the painters clearly felt. 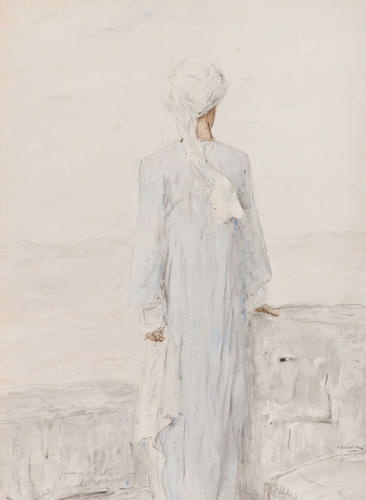 The main image shows Walter Charles Horsley's 1883 work ‘Women and an Old Man in the Harem’ and the above image is Marius Bauer's 1918 work, ‘Viewing the Landscape’. There are also numerous photographs, from private and museum collections in Turkey, which examine this imaginary Ottoman world through scenes set up by travellers and diplomats visiting Istanbul in the early 19th century. Thorough, involving, poignant and sometimes humorous, 1001 Faces of Orientalism is, in many ways, a lighter, visual equivalent to Saïd’s definitive text. 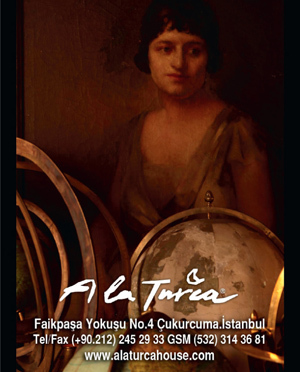 For anyone with a specific interest or just an interest in the region, it is really one of the most glowing exhibitions on in Istanbul right now and should not be missed.